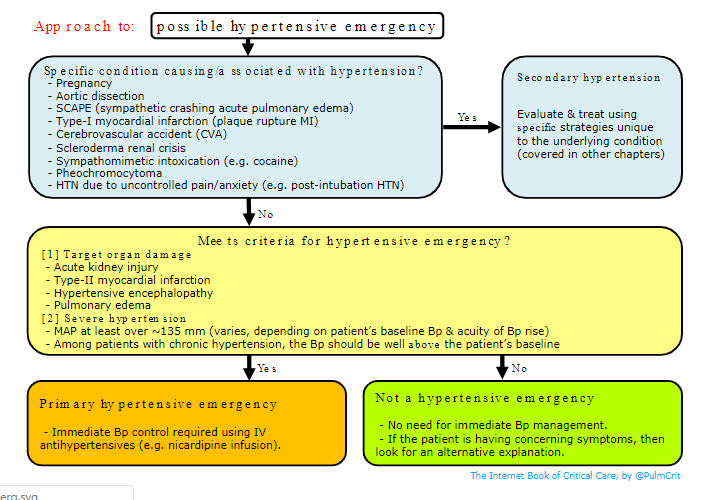 This post contains excerpts from Dr. Josh Farkas‘ Internet Book of Critical Care [Link is to TOC] IBCC chapter and cast: Hypertensive Emergencies [Link is to the chapter]. And here is the link to the podcast. Don’t skip either one. Secondary hypertension is used here to refer to HTN which is a result of some other primary process. In most cases, the primary process will be more obvious clinically, dominating the initial clinical presentation (e.g. aortic dissection, sympathetic crashing acute pulmonary edema, cocaine intoxication). Treatment will vary widely, depending on the specific context. This will be covered in other chapters regarding these individual conditions. Please note that the remainder of this chapter doesn’t necessarily apply to secondary hypertension (for example, do not use this as a guide to pregnancy-associated hypertension and pre-eclampsia*, which requires an entirely different approach). This entry was posted in Critical Care, Endocrinology, IBCC By Dr. Josh Farkas. Bookmark the permalink.